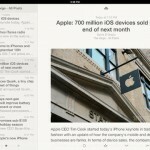 Reeder 2 Arrives As A Universal App, But Was It Worth The Wait? 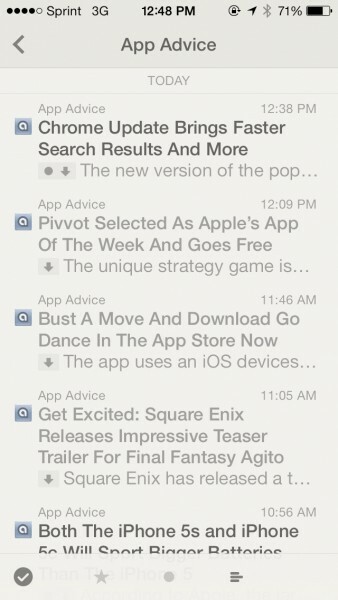 Reeder 2 ($4.99) by Silvio Rizzi is the brand new iOS 7-ready version of the popular RSS reader. 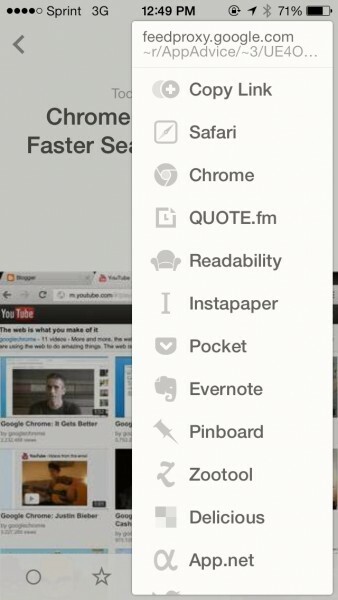 After it’s last major update, Google Reader died and Reeder had to make some changes to have the app work. Now, with iOS 7 on the horizon, Reeder 2 is back with some changes to go with the biggest revision of iOS to hit since, well, ever. 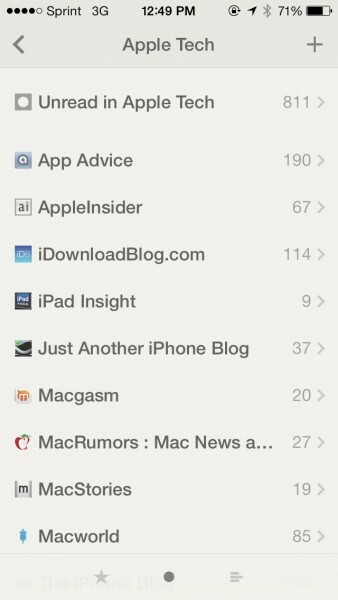 Ever since Reeder first came out back in 2009, it has been my go-to RSS app for my iPhone. Then I was ecstatic when it came to the iPad around 2010, though I ended up staying with Mr. 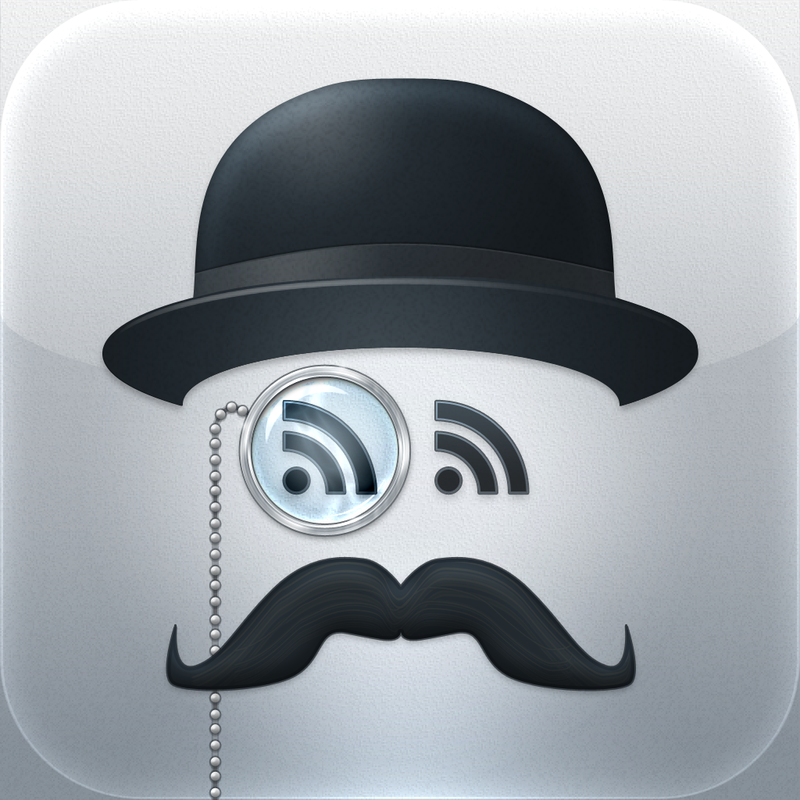 Reader for my iPad RSS-ing due to powerful features. 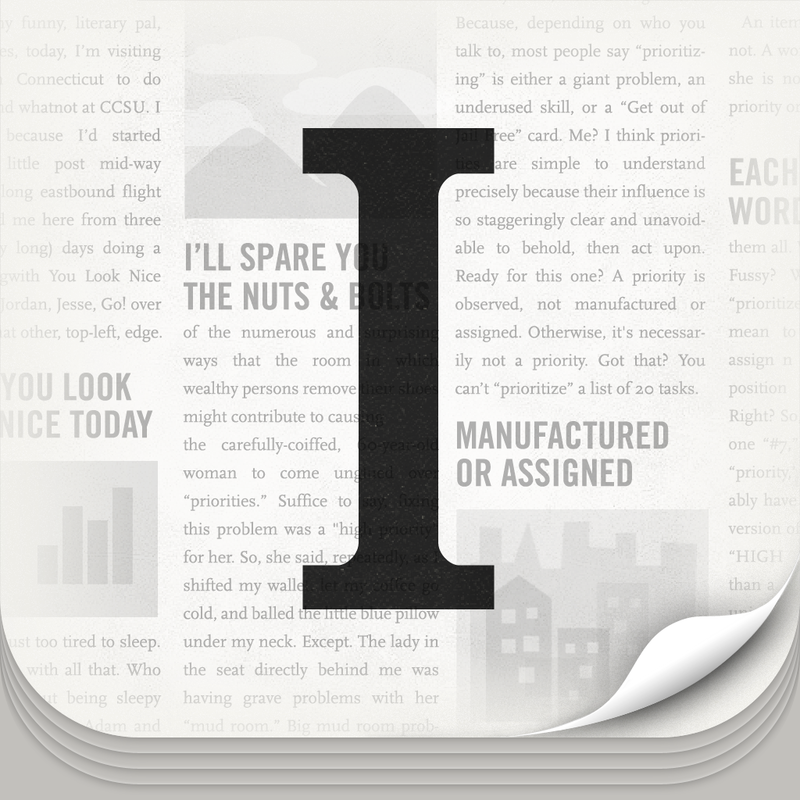 And now, Reeder 2 for iOS has become a completely universal app, so for one price you will get it on your iPhone (or iPod touch) and iPad. 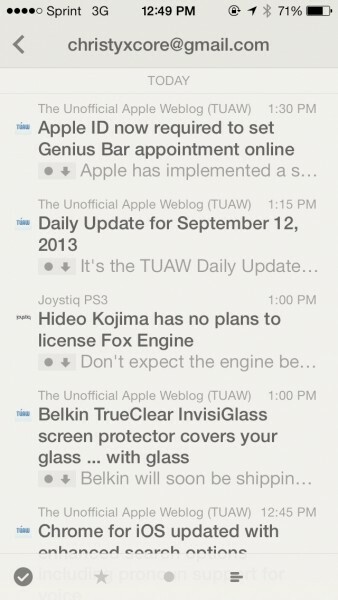 While the app is pretty much the same as the previous iPhone version of Reeder, Reeder 2 has a brand new interface. 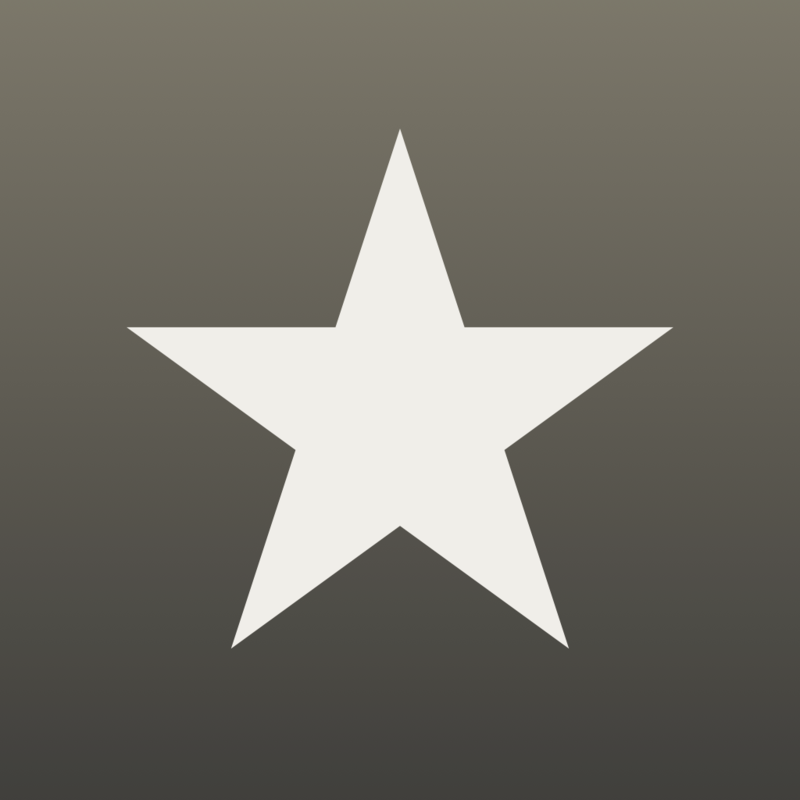 Gone are the faux textures and tape that made Reeder what it was — everything has been replaced with dark themed menus and a flat design that will feel right at home on iOS 7. I rather miss the tape elements, but the new design is simple and clean enough, so it’s not too bad (the tape will live on forever in my memories). The article list and reading view will still be in the light theme, with no way of changing it for those who like to read at night before bed, unfortunately. The navigational menubar at the bottom remains the same (Starred, Unread, and All Items), although now there will be text that pops up briefly to show you what section you’re in, before disappearing again. It’s a nice touch that shows Rizzi’s attention to detail in terms of design. 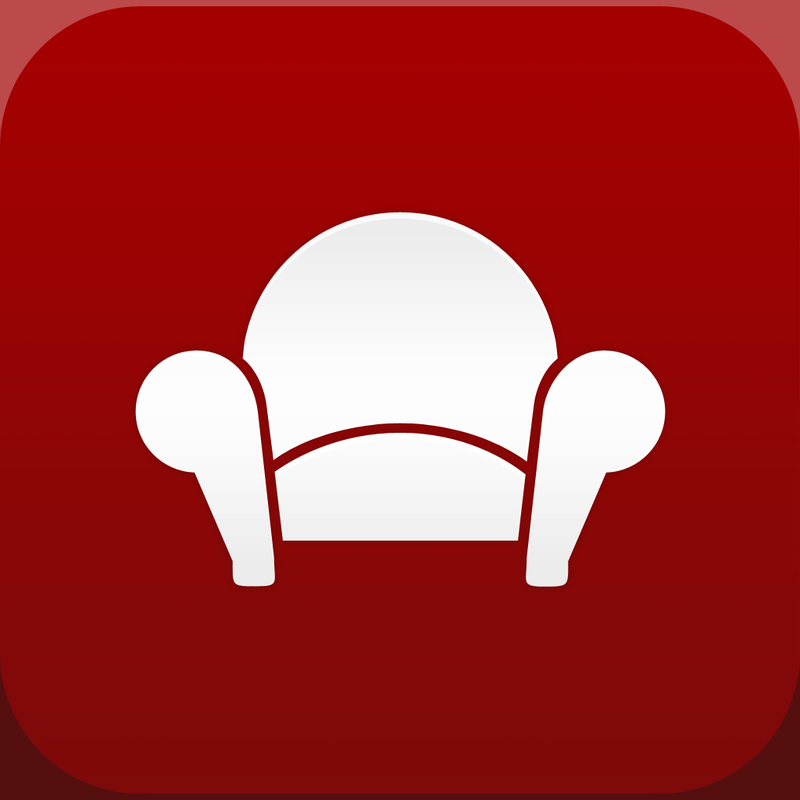 There are no more traditional buttons in Reeder 2, as these are all tossed out in favor for flat arrow icons that represent going to the previous view, as per iOS 7. Overall, if you’ve been using the original Reeder for quite some time, then this iOS 7 optimized version should come natural to you. On the iPad, there is no longer the little “magazine” icons that you would tap and pinch through to access your feeds. 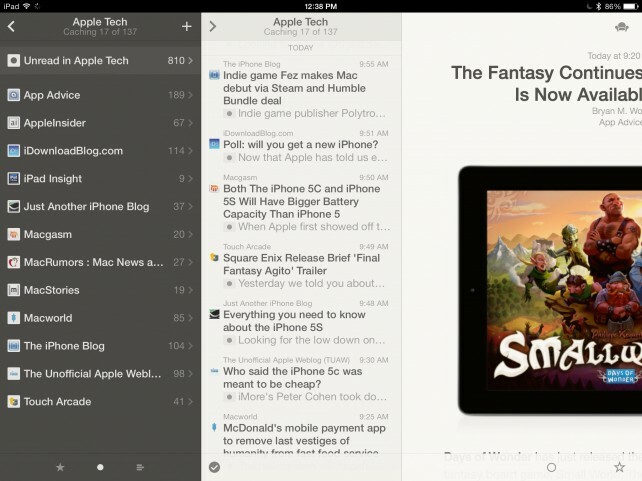 Instead, Reeder 2 on the iPad is very close to the iPhone version, with the difference of having multiple panes on the screen at once. It reminds me of Mr. Reader’s layout, which was very straightforward. 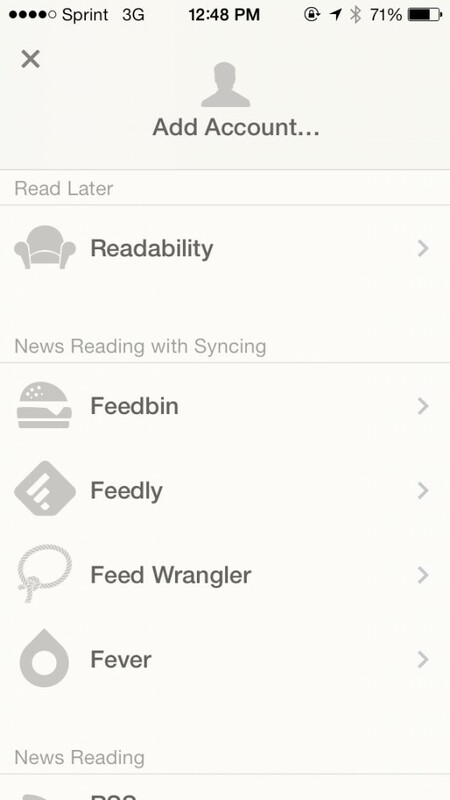 Reeder 2 will have support for Readability, Feedbin, Feedly, Feed Wrangler, and Fever. You can add as many accounts as you wish, and customize the settings per account before the app loads up everything. You will be able to see all of your accounts from the Accounts panel, with a number representing the total number of unread items, and when it was last synced. 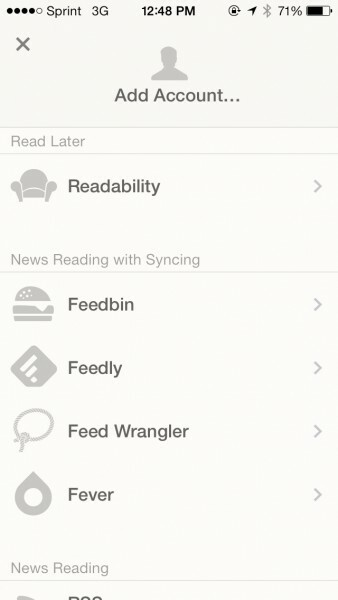 The feed list will show all of your folders and individual feeds, as they always did. The All Items option is at the very top if you want to go through everything at once. 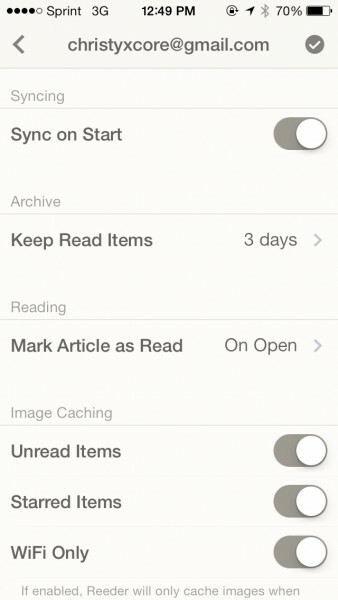 A setting is available in Reeder 2 to allow you to display the Direct Article List when viewing a folder or just individual feeds. 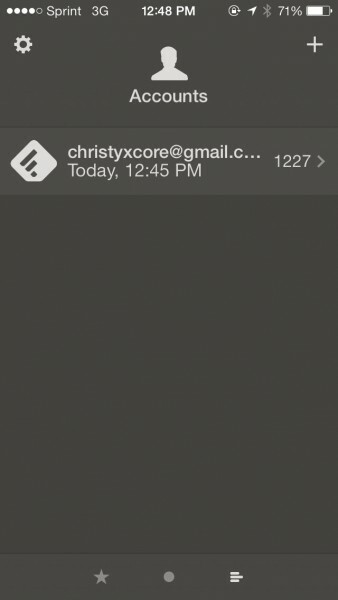 You can manually add subscriptions at any time with the “+” button in the top right corner. The feed/folder list will also show you what the last thing you were in was, since it is highlighted in gray. 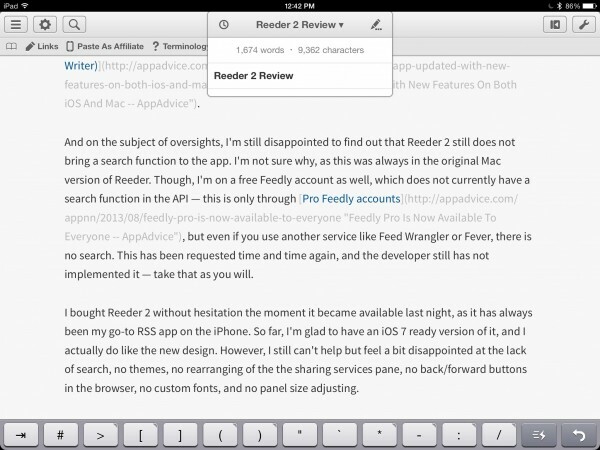 No matter what view you’re in, you can refresh Reeder 2 at any time by utilizing the famous pull-to-refresh gesture. 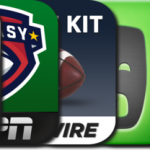 The logo of whichever service you choose to use will be shown at the top, and it will go from gray to black when it is pulled all the way down. Again, I thought this was a nice touch. When you view an article, it’s pretty much the same view you may have come to love. The headline is shown at the top, with the source and author underneath, and all of it is a tappable link to the full web view. The reading experience is tidy and focuses on the content, which is just what you need. 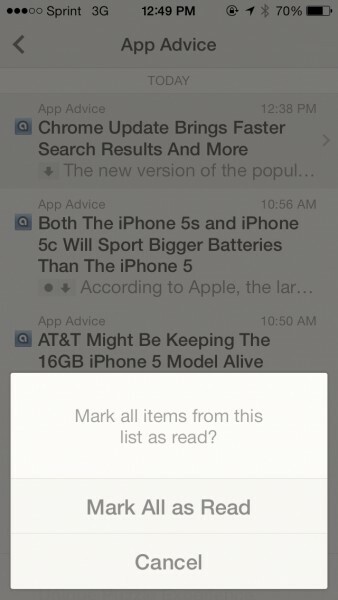 Of course, this depends on whether or not the feed itself is truncated or gives full articles rather than excerpts. At the bottom will be the menubar for marking an item as unread/read, starring, navigating to the next or previous article, and the new share pane. 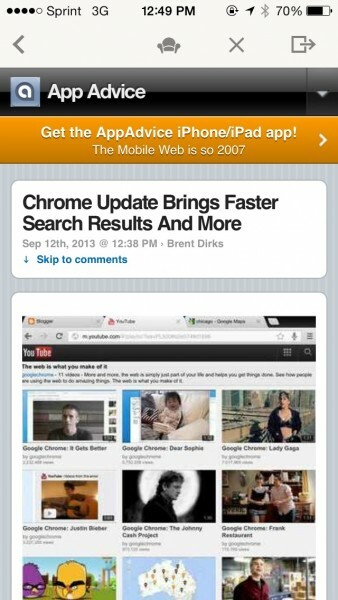 The share pane has been redesigned, and is no longer just a pop-up on the screen when you tap on the button. 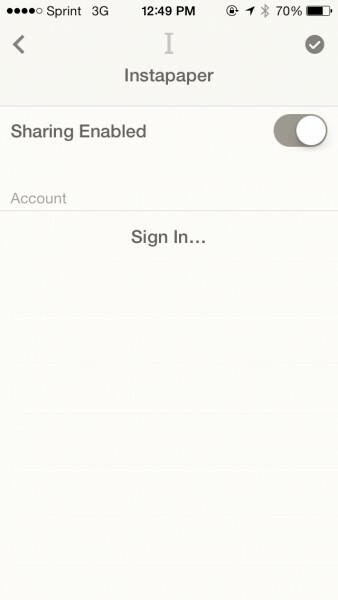 You can access the new share pane by the button, or by swiping your finger from the right edge of your screen. Now the sharing options and services will appear as a list, rather than a convoluted grid as it did before. You can toggle what services appear in the list from the Service Settings. 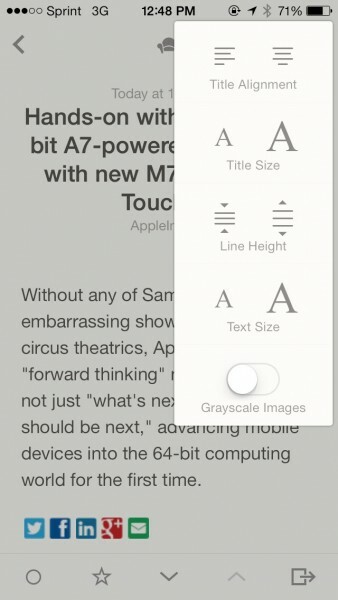 While reading, you can change the appearance of the article view by tapping on the “Aa” button in the top right, which brings up options for adjusting title alignment, title size, line height, text size, and a toggle for grayscale images. In the age of customizable reading views, I was a bit sad to see that there are no options for changing the typeface, as you could in apps like Instapaper. 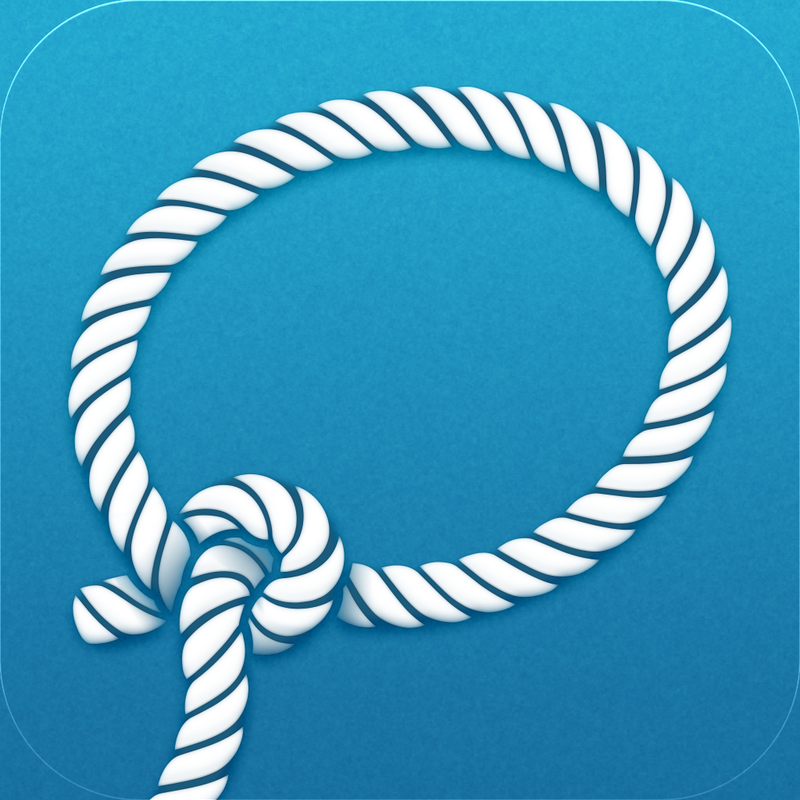 To return to the previous page in the in-app browser when clicking various links, just swipe left or right on the navigation bar to go back or forward. This was done to reduce the amount of buttons on the menu bar. On the iPad, you are not able to adjust panel widths either. All of the panels have a set size and cannot be changed, which I find to be weird, as we are in an age where most apps can be completely customized to user preference (unless the app doesn’t do that as a feature, like iA Writer). And on the subject of oversights, I’m still disappointed to find out that Reeder 2 still does not bring a search function to the app. 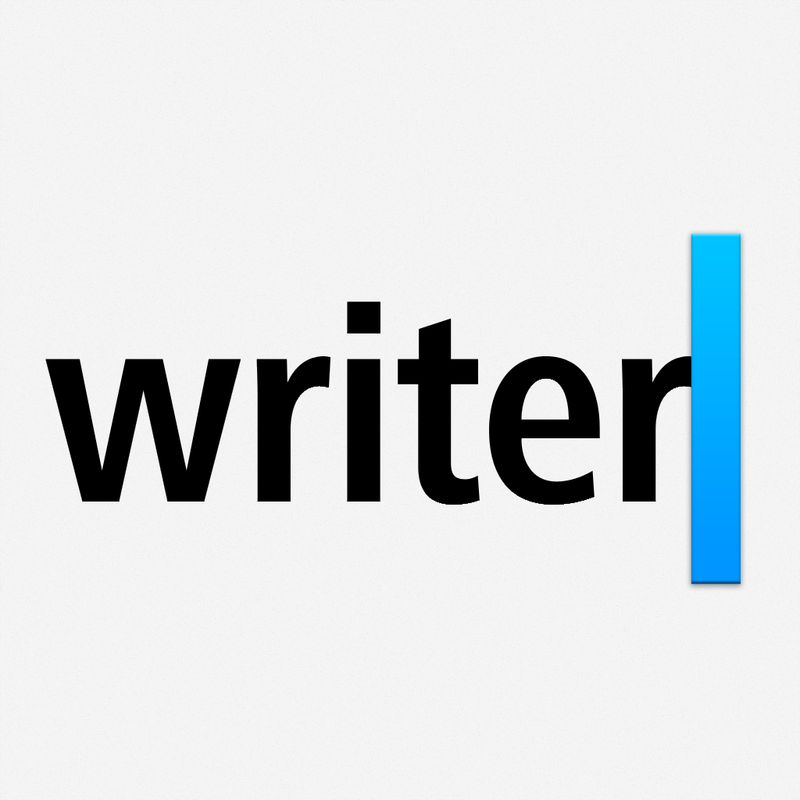 I’m not sure why, as this was always in the original Mac version of Reeder. 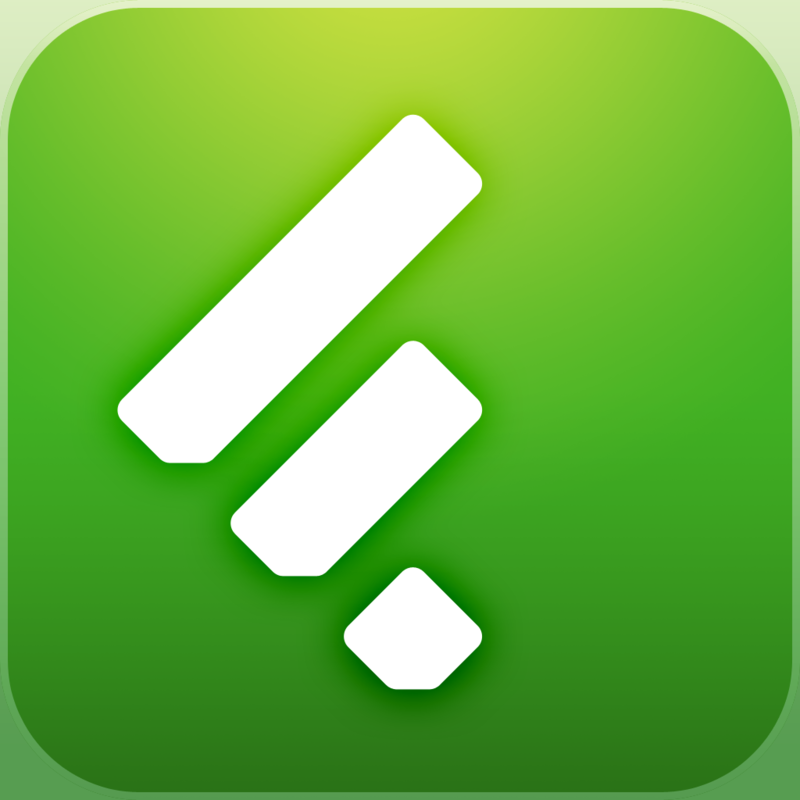 Though, I’m on a free Feedly account as well, which does not currently have a search function in the API — this is only through Pro Feedly accounts, but even if you use another service like Feed Wrangler or Fever, there is no search. This has been requested time and time again, and the developer still has not implemented it — take that as you will. I bought Reeder 2 without hesitation the moment it became available last night, as it has always been my go-to RSS app on the iPhone. So far, I’m glad to have an iOS 7 ready version of it, and I actually do like the new design. However, I still can’t help but feel a bit disappointed at the lack of search, no themes, no custom fonts, and no panel size adjusting. Personally, I’ll still be using Reeder 2 on my iPhone (I can’t ween myself off of it, and I haven’t found a better alternative for my needs yet), but for my iPad, I will continue to use Mr. Reader. 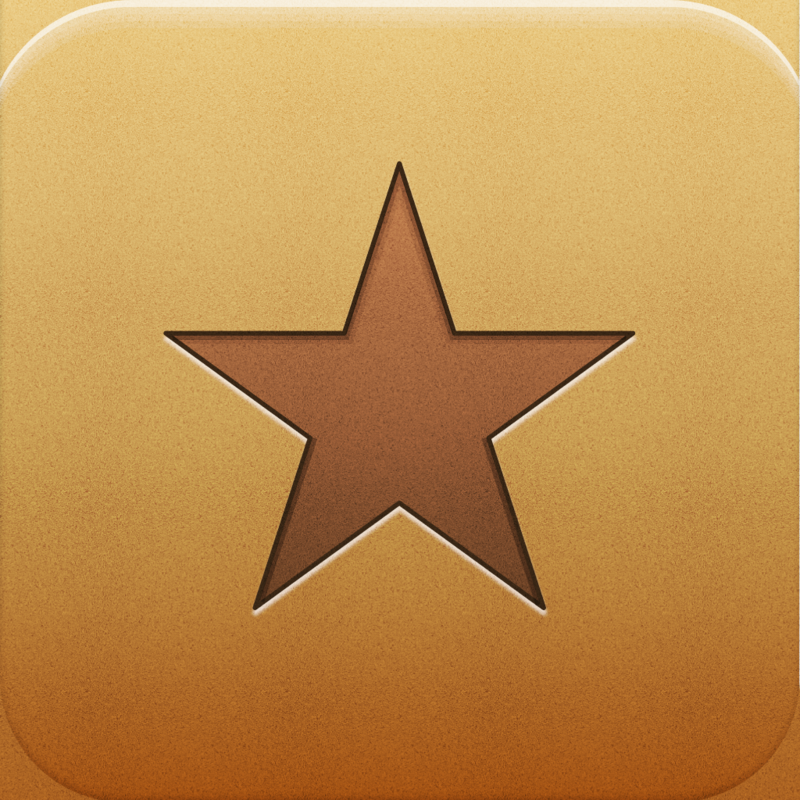 Reeder 2 can be found in the App Store as a universal app for $4.99.